According to the Condé Nast Traveller, Brazil is one of the “Destinations to watch in 2013”. So why not come to enjoy Carnaval? If you start planning now you can still make it! The festivities starts on February 8th and officially ends on the 12th. However, there will be plenty of things going on until the 17th. The Sambadrome is the Carnival mecca. It’s where the magic happens and where the amazing Samba Parade on Carnival week takes place. It’s a must go! Rehearsals that are almost like the Parade but without costumes and with less participants also takes place there, starting already in December. It is also possible to do a tour during the day. Rio de Janeiro, as the City of Carnival, offers a selection of Carnival balls. Though hundreds of balls happen all over the city, some are always better bets than others. The most traditional and popular ones are at the Scala and Mangueira Samba School. But the most glamorous is definitely the Copacabana Palace Ball. Each neighborhood in Rio has its favorite Bandas or Blocos. 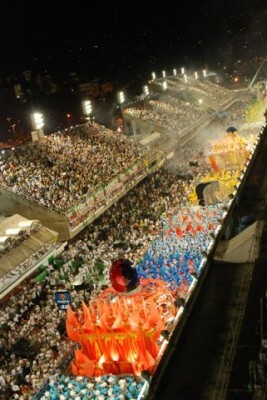 Both consist of an orchestra marching along a pre-determined route, followed by hordes of enthusiastic samba dancers. They may come dressed in costumes, bathing suits, plain clothes, special T-shirts, or even in drag. It’s free, spontaneous, and everybody’s welcome to participate! Check out Condé Nast article here.